The inability to catch your breath is a terrifying experience for anyone. 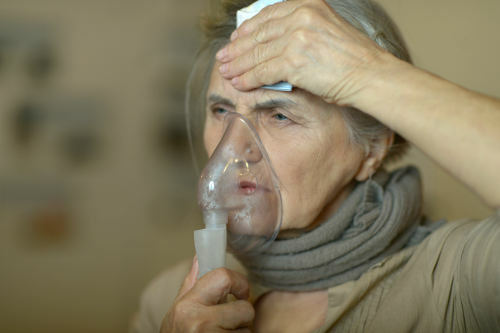 Dyspnea, or shortness of breath, can be described as the feeling of your lungs fighting for air or that you are suffocating. Many people have experienced this condition in extreme cold temperatures, after strenuous exercise, or at very high altitudes. Dyspnea is also a symptom of many health conditions. We will look at the possible causes and home remedies to alleviate an alarming episode of shortness of breath. Dyspnea occurs when the passages supporting the transportation of oxygen are injured or damaged. Our heart and lungs are responsible for supplying our tissues with oxygen and removing carbon dioxide. Any interruption of this process can cause shortness of breath. This can be the result of a sedentary lifestyle with insufficient exercise, but for most people, dyspnea is caused by a major health problem. Other lung-related conditions that can hinder your breathing process include croup, pulmonary edema, pleurisy, pulmonary hypertension, sarcoidosis, lung cancer, bibasilar atelectasis and tuberculosis. Heart problems such as heart arrhythmias, pericarditis, and cardiomyopathy can also cause shortness of breath. Dyspnea is often seen with anemia, anxiety, epiglottitis, rib injuries, myasthenia gravis, and Guillain-Barre syndrome. Depending on the cause, shortness of breath can happen at anytime. It can be very concerning when it happens while at rest, or lying down. The following three major health issues can prevent you from getting sufficient sleep and your entire body from reenergizing. Known as COPD, this health condition affects the breathing passages as they become blocked or obstructed. Varying degrees of inflammation can result in mild or severe dyspnea. It is most often caused by the damage of years of smoking but can also be seen with cases of asthma, chronic bronchitis, or emphysema. Using pillows to prop your head and upper chest up during sleep can help. A serious breathing condition is sleep apnea. As the name suggests, it occurs during your sleep cycle and can be detected by snoring or extreme fatigue during the day. This disorder is more common in those with abnormally thin necks, obesity, or any condition that causes your neck muscles relax to the point that breathing passages narrow. Sleep apnea can result in heart disease, memory and concentration issues, and depression if not treated, according to the American Sleep Apnea Association. Heart disease affects the workings of your heart, including the pumping of blood and transfer of oxygen. When lying down, your heart must work harder and damage of blood vessels can lead to labored breathing at this time. Shortness of breath can also be noticed during daily activities with heart disease. How Is Dyspnea (Shortness of Breath) Diagnosed? To properly diagnose dyspnea, experts advise that you keep a journal of shortness of breath episodes, recording the length, severity, and what you were doing at the time of the incident. A complete routine physical by your doctor will determine if dyspnea is your diagnosis as well as testing such as X-rays and computed tomography (CT scan). Tests performed will examine your lung capacity, oxygen levels, and the transfer ability of your blood. These can include a chest radiography, electrocardiography, spirometry, and laboratory evaluation. You may also need to undergo stress testing, ventilation scanning, right heart catheterization, or bronchoscopy. If you suffer from shortness of breath, there are several lifestyle changes you can make to prevent breathing troubles from progressing. Avoid smoking or being around second-hand smoke. Use pillows to prop up your head and upper chest while sleeping. Keep bedroom at a cool temperature. Avoid allergens and environmental pollutants. Use a humidifier when environment conditions are dry. Keep hydrated to maintain moisture of mucus. Take short breaks when performing tiring tasks. Avoid hiking elevations of 5,000 feet or higher. Asthma patients should use an inhaler before all forms of exercise. To treat episodes of shortness of breath naturally, try the following recommendations. A cup or two of black coffee may help return your breathing to normal. Caffeine works to stimulate muscle fatigue, which could prompt airways to open fully. Help relieve mucus issues, congestion, and infections with the powerful properties of raw ginger. Enjoy two to three cups of ginger tea. Add one tablespoon of chopped ginger to two cups of boiling water and allow to simmer for five to 10 minutes. You can add a touch of honey for taste. You may also get immediate relief by chewing fresh ginger. Some dyspnea episodes can be caused by low iron in the blood. To help restore iron, drink a blended combination of beetroot juice, three carrots, spinach and one-half sweet potato. You can also absorb iron by eating beetroots with their peelings. Similar to expectorant medications, fennel seeds target phlegm, which can hinder breathing. Make a tea with one teaspoon of fennel seeds and hot water. Consuming raw fennel seeds may also aid in restoring normal breathing. If your shortness of breath is caused by a blockage or inflamed airways, try using steam to open passages. Create your own personal steamer with a bowl of hot water and place a towel over your head and shoulders as you position your face directly over the bowl. You can also add peppermint or eucalyptus oil to the water for relief. While some exercise can stimulate breathing problems, a casual walk can help to open breathing passages for immediate treatment of dyspnea. The effects can also tackle causes such as obesity and anxiety. These relaxation therapies will stimulate blood flow and help your body receive essential oxygen levels. It will also relieve stress, which can induce shortness of breath. Pursed-lip: This breathing exercise will help return breathing back to a normal pace and can relieve any anxiety that accompanies dyspnea. Sit in a relaxing and comfortable position and press lips together, leaving a tiny opening in the center. Inhale through your nose for two seconds, as if you are smelling an aroma. Exhale through the small lip opening at a slow pace for four seconds. Repeat until you have control over your breathing again. Diaphragmatic: This deep breathing technique calls for lying down on your back with hands on stomach. Take deep breaths through your nose, feeling your stomach rise. Hold breath for two seconds before exhaling through your mouth. Do this for five to 10 minutes. From one time to another, we have all experienced a form of shortness of breath due to strenuous activity or a mild illness. When it is a constant problem due to a medical condition, it is referred to as dyspnea. This frightening occurrence can range from a sudden breathing resistance to the feeling of asphyxiation or complete cut-off of breathing. While it is important to manage any underlying cause of dyspnea, for immediate treatment of sudden attacks, there are natural remedies you can try at home. “Shortness of Breath,” Mayo Clinic; http://www.mayoclinic.org/symptoms/shortness-of-breath/basics/definition/sym-20050890, last accessed March 3, 2017. Shiel Jr., W., “Shortness of Breath (Dyspnea),” Medicine Net; http://www.medicinenet.com/shortness_of_breath/symptoms.htm, last accessed March 3, 2017. Newell, L., “Causes of Shortness of Breath When Lying Down,” Livestrong, March 6, 2011; http://www.livestrong.com/article/82853-causes-shortness-breath-lying-down/, last accessed March 3, 2017. Dresden, D., “Dyspnea: Causes, Symptoms and Treatments,” Medical News Today, January 2, 2017; http://www.medicalnewstoday.com/articles/314963.php, last accessed March 3, 2017. Wahls, S., “Causes and Evaluation of Chronic Dyspnea,” American Academy of Family Physicians, July 15, 2012; http://www.aafp.org/afp/2012/0715/p173.html, last accessed March 3, 2017. “How to Manage Shortness of Breath,” Top 10 Home Remedies http://www.top10homeremedies.com/how-to/how-to-manage-shortness-of-breath.html, last accessed March 3, 2017.